There is even evidence to suggest that the microbiome affects us on such a fundamental level that it can regulate the expression of our DNA! This growing body of science has helped inform an even more exciting scientific prospect: the idea that intentionally altering an individual’s microbiome could have significant impacts on overall health, resistance to disease, and longevity. It is increasingly evident that our lifestyle choices—what we eat, how much and how well we sleep, and the amount of exercise we get—can change the composition of our microbiome and impact the state of our health. It’s a beautiful, commensal relationship: our lifestyle choices affect the health and resilience of our resident bacteria and those bacteria, in turn, affect our own health and resilience. The influence of the microbiome is driven not only by the gross quantity of microbes present, but also the composition and diversity of the bacteria. It’s an awe-inspiring concept when you take a moment to let it sink in! I’ve written before about the importance of the microbiome, the best ways to consume probiotics, and which species to hone in on when developing a microbiome-friendly diet and supplementation program. 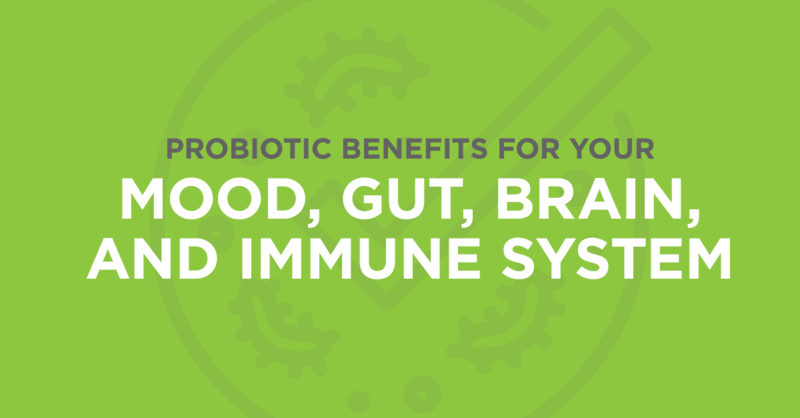 However, I’d like to take a few moments to highlight just how beneficial a probiotic-rich diet can be in four key areas of health: your mood, gut health, brain health, and immune system. The idea that microbes living within the digestive track can impact an individual’s temperament may seem far-fetched, but there is compelling science to suggest that this is precisely the case. One study linking the microbiome to mood was published by a group of researchers in April 2015 in the peer-reviewed journal Brain, Behavior, and Immunity. Study participants were broken into two groups, with one group receiving a probiotic food-supplement and the other a placebo. At the end of four weeks, study participants that received the probiotic intervention demonstrated reduced reactivity to sad mood, lending credence to the idea that probiotics can help improve a negative mood. Another study, conducted by researchers at UCLA and published in Gastroenterology, arrived at a similar conclusion. This study found that consuming fermented milk, which is rich in probiotic bacteria, actually changes the brain’s emotional response to stimuli on a structural level. Participants who drank the probiotic-rich drink responded differently to emotional faces in comparison to controls, differences that were highlighted in functional magnetic resonance imaging (fMRI) testing. Consuming a probiotic-friendly diet clearly has the potential to change how we view, and respond to, the world around us. The most readily apparent benefit of consuming probiotics is their impact on digestion. We intuitively understand that consuming probiotics would have a positive impact on the gut because that is precisely where they end up after being consumed. One of the most common uses of probiotics is in addressing diarrhea and constipation. Studies have shown that probiotics can help treat a wide variety of types of diarrhea, including antibiotic-associated diarrhea; interestingly enough, they can also have a seemingly opposite impact on the digestive tract by preventing constipation. Another powerful link between the gut and overall health lies in the development of obesity. A study recently published in the scientific journal JAMA Pediatrics compared the gut bacteria of children who were breastfed with children who were given formula early in life. Those children who were given formula underwent changes in their microbiome, including elevated levels of Firmicutes relative to Bacteroides, that were associated with an increased risk of being overweight or obese in the first year of life. Another study linked the beneficial weight loss generated by every-other-day (intermittent) fasting to changes in the microbiome precipitated by the diet itself. Every-other-day fasting elevates acetate and lactate, two fermentation byproducts of the microbiome, and selectively stimulates beige thermogenesis. However, these results were not observed in microbiota-depleted mice models, suggesting that the microbiome itself likely plays a critical role in facilitating the weight loss commonly seen with intermittent fasting. One of the most powerful connections between the gut microbiome and the other major systems of the body lies in the microbiome’s ability to regulate systemic inflammation. Inflammation is at the root of most of the debilitating chronic neurological conditions we face today, so probiotic interventions that balance the gut microbiome and reduce inflammation have the potential to drastically improve brain health. The most common inflammatory condition that may be influenced by probiotic interventions is Alzheimer’s disease, which is one of the most pervasive and debilitating forms of dementia. One study recently published in the journal Nature evidenced the connection between the microbiota and the pathogenesis of Alzheimer’s using 3xTg-AD mice, a unique, triple transgenic mouse model of Alzheimer’s. The study found that inducing changes in the microbiome of these mice positively impacted neuronal pathways in their brain, slowing cognitive decline and the progression of Alzheimer’s disease. While the results of an animal study cannot be directly transferred to humans, the study still holds great promise in helping us understand and combat this devastating condition and presents a potential role for microbiota modulation in the treatment of Alzheimer’s. Other studies have shown that other little-understood neurological conditions, such as attention deficit hyperactivity disorder (ADHD), may be prevented or controlled with probiotic interventions. It has been suggested that gut dysbiosis, or an imbalance in the microbiome, could play a critical role in the development of ADHD. Interestingly, children with ADHD suffer from constipation at an almost three-fold higher rate than those without ADHD. This is compelling evidence that there is a connection between what is happening inside the brains and guts of children suffering from this condition. There is a growing understanding among the scientists studying autoimmune conditions that autoimmunity may originate in imbalances in the gut microbiome. Many common autoimmune conditions, including multiple sclerosis and Crohn’s disease, have roots in the gut microbiome and have been shown to respond favorably to probiotic interventions. It has also been theorized that psoriasis, a skin condition long-thought to be driven by the immune system, might actually be driven by a “leaky” gut that allows lipopolysaccharide-binding protein (LPS) to get into the bloodstream. Probiotic interventions have shown promise in reinforcing the gut lining, thereby decreasing gut permeability and allowing the gut microbiome to rebalance and flourish. Finally, specific strains of probiotic bacteria like L. plantarum and L. acidophilus have been shown to boost immunity and help protect people from common infections like the flu and common cold. Given the wide-ranging importance of the microbiome in overall health, the obvious next question is: what can be done to promote the vitality and diversity of your microbiome? There are two sides to this: things to avoid and things to emphasize. There are a number of everyday items that may disrupt your microbiome and should be avoided, including antibiotics, gluten, natural and artificial sugars, chlorine, home goods made with BPA-laden plastics and many of the artificial ingredients found in processed foods. Conversely, consuming a diet that contains plentiful prebiotic fiber—a specific type of carbohydrate that humans cannot digest but that our gut bacteria thrive on—foods rich in probiotic species of bacteria, and supplementing with those probiotics that are not readily available through food sources, can help ensure your microbiome flourishes. The growing science of the human microbiome and its wide-ranging impact on overall health are absolutely fascinating. Our ability to harness the power of the microbiome to prevent or control a variety of chronic and acute conditions is only starting to be understood, but it is nonetheless an incredibly important development in medical science. Hopefully you can take advantage of some of the potential benefits discussed above and implement them in your daily life to improve your health and longevity!